I’m seeing the Replacements at the Roundhouse tomorrow night, so I’ve decided to take a break from our bass-player series and repost this piece from a year or so back on my favourite Mats song. More bassists on Thursday, unless I decide to write about the show instead. 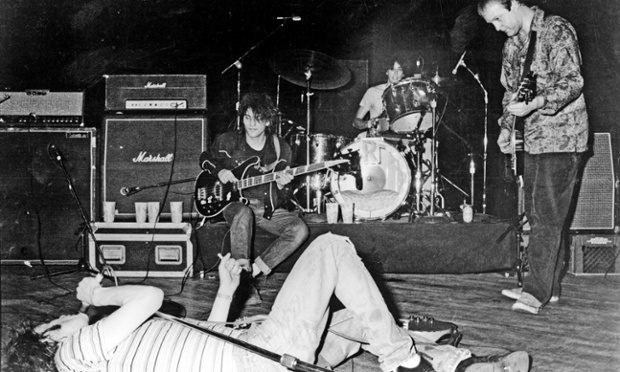 To a certain cast of mind, the Replacements’ self-sabotaging drunkenness and apparent disregard for professional advancement is endearing, and makes everyone else look careerist by comparison. Such a mindset doesn’t take into account the possibility that Paul Westerberg and his bandmates knew the value of their image as beer-sodden losers, and maybe got ahead by affecting not to care whether or not they got ahead – after all, it’s difficult to end up signed to Warner Bros. by accident. But when I was a kid, working backwards from my beloved Nirvana, trying to work out who influenced them so I’d know who to listen to next, stories about the Replacements and their exploits made them seem cool and exciting. The band weren’t widely known, but well-known enough for their records to be available, and they had some influential rock-critic voices speaking up for them: Gina Arnold dedicated a chapter of her On the Road to Nirvana to them; a few years later Michael Azerrad would do the same in Our Band Could Be Your Life. In October last year they were even included in the list of acts eligible for induction into the Rock & Roll Hall of Fame, along with Peter Gabriel, Nirvana, the Meters, NWA, Chic and Hall & Oates. The crucial thing to me isn’t that Unsatisfied is cleverly crafted and universally relatable, although it is – it’s Westerberg’s performance of it and his band’s empathetic playing (especially Chris Mars’s drumming). It’s why every cover of it I’ve hear falls flat. Westerberg’s voice was not a tutored one, and was quite a limited one, but his hoarse bellows on Unsatisfied are the song. His performance is perfectly judged, rising in intensity all the way through the second verse and chorus (which ends with a discordant reading of the line “Are you satisfied”, in which only the last word is enunciated), until he reaches the song’s key line: “I’m so, I’m so unsatisfied”. It doesn’t look like much on paper, but Westerberg’s delivery of it will make your hair stand up. The tension-building of that first unresolved “I’m so” – you know that the resolution can’t be a positive one – lasts only a few seconds, but the whole song rests on that one moment. This entry was posted in Music and tagged 1980s, 1984, Aching to Be, Alex Chilton, alternative rock, arrangement, bass guitar, Bastards of Young, Big Star, Bob Stinson, Can’t Hardly Wait, Chic, Chris Mars, Daryl Hall, Drums, Gina Arnold, Guns N' Roses, Here Comes a Regular, I Will Dare, I’ll Be You, John Oates, Left of the Dial, Let It Be, Michael Azerrad, Minnesota, Nirvana, NWA, On the Road to Nirvana, Our Band Could Be Your Life, Paul Westerberg, Peter Gabriel, Sire, Skyway, songwriting, the Meters, The Replacements, Tommy Stinson, Unsatisfied on June 1, 2015 by rossjpalmer.